It’s a perfect day for an early morning walk. I begin with a turn off of Lafayette Street, and onto Sidney for a single block and am at the start of Washington Street. An arch of the greenest leaves in town welcomes me. Flowers seem to jump forward to get a better look at who is coming. Homes that were built over 100 years ago seem as if time has stopped just for them. Washington Street is one of the many streets in town where I can stand, close my eyes and be transported to another time. I can easily envision people leisurely strolling the paths or rocking away in a chair on the porch of a neighbor. Cape May is abundantly rich in history; but this street has it’s very own story to tell. On both sides of Washington Street I see the Victorian houses which have built Cape May’s modern reputation. The names on the houses read like a “who’s who” of the town. Sawyer, Hand and Hughes … early founding names important in Cape May’s history but meaning little to the vacationing passer-by. Just past a tall hedge I come upon the largest house in the 1000 block of Washington. The “stick style” architecture of the former home of Dr. Emlen Physick with its corbelled chimneys has been preserved, transformed really, by Cape May’s Mid-Atlantic Center for the Arts capturing the essence of what it was like to live on Washington Street in the late 1800s. The old Model A Ford behind an abundant flower bed is similar, I’m told, to the one the doctor himself drove. Washington Street. The American flags posted on the porches of Victorian homes pepper the greenery of summer and it’s not just a recent phenomenon. Most of these 110+ year-old houses have been beautifully restored with freshly painted bargeboard, delicately planted gardens, and porches, one after another, with wicker and cane rockers topped off by “Old Glory” — a truly American scene. Where Jefferson crosses Washington Street is another grand old home that has graced Cape May since 1863. The George Allen House, now called the Southern Mansion, was designed by the internationally-acclaimed architect Samuel Sloan. Sloan’s American bracket, post and beam villa was constructed by Henri Phillipi, during the Civil War. The estate itself once occupied an entire block, but in 1938 a “new” post office was built on the corner of Franklin and Washington Streets on what was part of the estate. In 1946, the last remaining heir to the George Allen estate died and the property was sold. A new owner turned the huge home into a boarding house. Thus began the demise of the mansion. Soon the entire building was transformed. The earth-tone colors of the exterior were painted white. Inside, large living spaces were broken into many small rooms. When the owner failed to maintain the building well enough, they lost their boarding house license. It sat in disrepair for years until the Bray/Wilde family acquired it in 1994 and immediately began restoration. The ballroom was brought back to life. The original colors came back to the exterior and the gardens bloomed with beauty. Additions made to the mansion were so well-executed that one is hard pressed to know they aren’t original. Today a tall privet hedge separates the Southern Mansion from Washington Street itself, but passers-by can stop to tour the stately mansion on almost any given day. Though most remain private dwellings, more than a dozen of these Victorian homes have been turned into bed and breakfast inns or guest houses. Alexander’s Inn (the Jos. Hughes House circa 1880), Woodleigh House (circa 1866), the Thomas Webster House (circa 1876) the Duke of Windsor (circa 1896) Inn at the Park, (circa 1893) and the Jeremiah Hand House (circa 1885) all typify what years of creative and dedicated labor can restore. Others include Antoinette’s Guest Apartments across from the post office, Canterbury Manor, the Billmae Cottage, the Shore Haven and Heritage House. Are all fine examples of a bygone era made more beautiful and functional. Many can be toured by the public at certain times of the year. Past the post office on the right side of the street, one will find Cape May City Hall. The building was originally Cape May’s High School built in 1917. It became the seat of city government in 1961. 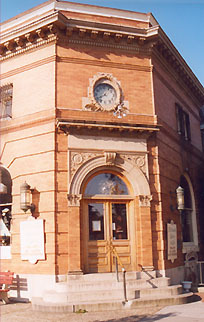 Cape May’s original City Hall was built in 1899 and could be found on the corner of Franklin and Washington where today the Fire Museum resides. The original City Hall building was home to the fire department, police station and municipal court. It was torn down in 1970. Tucked behind Alexander’s Restaurant and next to City Hall is the Colonial House Museum (circa 1775) run by The Greater Cape May Historical Society. This building was at one time a tavern and the family house of Revolutionary War Patriot Memucan Hughes. The museum has annual exhibits and several of the rooms have been preserved to reflect the colonial times. This summers exhibit is “First Person Memories of Greater Cape May”. The Colonial House Museum is open daily except Sunday from June 15- September 15 and Victorian Week, Sept 11-20th, 10am-2pm. Please visit www.capemayhistory.org for more information. 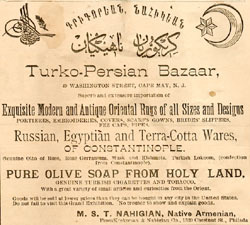 original store. Victorian Towers, a retirement community, now occupies most of the land where these shops once stood but the memories of what had been there before live in the minds of many Towers’ residents. Across from Victorian Towers is Washington Commons, a shopping area built in 1998. The walkways are full of people going from shop to shop. In the late 19th and early 20th centuries, one found a different kind of hustle and bustle. Here stood the old train station, the one that operated year-round. * Almost everything arrived by train in those days. People came from Philadelphia almost every hour. And conversely, Cape May natives were hopping trains back to Philadelphia. The travelers of the time must have been excited to learn they did not have to take the bumpy two-day carriage ride to the Cape. The train station remained on Washington Street until the mid 1930s when it was moved back onto Lafayette Street where it stands today. The train stopped running to Cape May on October 2, 1981. In 1998, the tracks were cleaned and Cape May heard the train whistle blow once more, but not from Washington Street. Postcard from 1908 of Washington Street from Perry. Click for larger image. 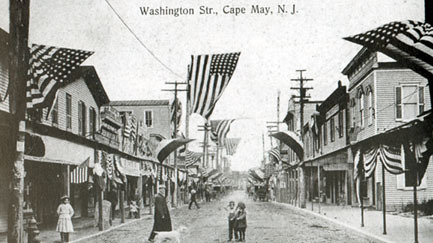 The three blocks of Washington Street, from Ocean to Perry Streets were made into a pedestrian mall in 1967 and have been the center of activity in Cape May for over 100 years. The mall today is not so different from what it once was. In the 1880s, it was the place where people would gather to shop, go to the doctor, buy remedies and provisions. was the smell of fresh bread. Where Washington crosses Ocean, what is McDowell’s Gallery today, started out as the New Jersey Trust and Safe Deposit Company, established in 1895. Next to McDowell’s is what is said to be the oldest New Jersey bakery in continuous use. In 1872, William Essen opened Essen’s Bakery and Ice Cream Saloon. In 1895, William passed the business down to his son who ran the bakery for another 20 years. In 1915, the property was rented to Kokes and Rueter. Carl Kokes purchased the building from the Essens in 1918 and operated his own bakery for many years. The current bakery in the building is the La Patisserie. “Monsieur Gras” continues to use the same original brick oven and dumbwaiter. The aroma of delicious baked goods wafts down Washington Street Mall as it did for over a hundred years. Tree on the corner, and an open section, almost an alley, filled with little shops. Washington Street ends abruptly at Perry Street, a stone’s throw from Congress Hall. As I finish my walk, I can’t help thinking of the changes Cape May’s Washington Street has gone through even since before I began to walk here twenty-five years ago as a child. Postcard from 1918 of Washington Street from Perry. This is the same area as the above postcard from 1908. Washington and Decatur. No date available. *Actually, the very first train station in Cape May was built on Grant Street and was only used in the summer season. Today, “Summer Station” condominium and motel, named for the original station, sits very near the same spot. Photo Credits: City Hall circa 1908, Mall circa 1908 and 1918, and the Reading Terminal Railroad 1928 are from Image of America: Cape May in Vintage Postcards by Don and Pat Pocher. The Liberty Theater and the view of Washington And Decatur Streets are courtesy of Mr. Carl Suelke.